This article is about the drug substance α-PVP. For the pharmaceutical excipient called PVP, see polyvinylpyrrolidone. α-Pyrrolidinopentiophenone (also known as α-pyrrolidinovalerophenone, α-PVP, O-2387, β-keto-prolintane, prolintanone, or desmethylpyrovalerone) is a synthetic stimulant of the cathinone class developed in the 1960s that has been sold as a designer drug. Colloquially, it is sometimes called flakka. [note 1] α-PVP is chemically related to pyrovalerone and is the ketone analog of prolintane. α-PVP, like other psychostimulants, can cause hyperstimulation, paranoia, and hallucinations. α-PVP has been reported to be the cause, or a significant contributory cause of death in suicides and overdoses caused by combinations of drugs. α-PVP has also been linked to at least one death with pulmonary edema and moderately advanced atherosclerotic coronary disease when it was combined with pentedrone. α-PVP acts as a norepinephrine-dopamine reuptake inhibitor with IC50 values of 14.2 and 12.8 nM, respectively, similar to its methylenedioxy derivative MDPV. Similar to other cathinones, α-PVP has been shown to have reinforcing effects in rats. α-PVP gives no reaction with the Marquis reagent. It gives a grey/black reaction with the Mecke reagent. Italy classified cathinone and all structurally derived analogues (including pyrovalerone analogues) as Narcotics on January 2012. ^ "SOFT Designer Drug Committee Monographs: Alpha-PVP" (PDF). Society of Forensic Toxicologists. September 13, 2013. Archived from the original (PDF) on April 6, 2015. ^ Coubrough, Jill (November 2, 2017). "'Zombie drug' flakka may have hit Winnipeg streets: police". CBC News. ^ England, Charlotte; Garcia, Feliks (August 17, 2016). "Flakka: What is the 'zombie drug' blamed for face-eating attacks?". The Independent. ^ Sauer, Christoph; Peters, Frank T.; Haas, Claudia; Meyer, Markus R.; Fritschi, Giselher; Maurer, Hans H. (2009). "New designer drug α-pyrrolidinovalerophenone (PVP): studies on its metabolism and toxicological detection in rat urine using gas chromatographic/mass spectrometric techniques". Journal of Mass Spectrometry. 44 (6): 952–64. doi:10.1002/jms.1571. PMID 19241365. ^ "Drugs of Abuse Emerging Trends". National Institute on Drug Abuse. 6 April 2015. ^ Marinetti, L. J.; Antonides, H. M. (2013). "Analysis of synthetic cathinones commonly found in bath salts in human performance and postmortem toxicology: Method development, drug distribution and interpretation of results". Journal of Analytical Toxicology. 37 (3): 135–46. doi:10.1093/jat/bks136. PMID 23361867. ^ Waugh; et al. (2013). "Deaths Involving the Recreational Use of α-PVP (α-pyrrolidinopentiophenone)" (PDF). AAFS Proceedings. Abstract K16. ^ Sykutera, M.; Cychowska, M.; Bloch-Boguslawska, E. (2015). "A Fatal Case of Pentedrone and -Pyrrolidinovalerophenone Poisoning". Journal of Analytical Toxicology. 39 (4): 324–9. doi:10.1093/jat/bkv011. PMID 25737339. ^ a b c "EMCDDA–Europol Joint Report on a new psychoactive substance: 1-phenyl-2-(1-pyrrolidinyl)-1-pentanone (α-PVP)". European Monitoring Centre for Drugs and Drug Addiction (EMCDDA). September 2015. ^ Julie A. Marusich; Kateland R. Antonazzo; Jenny L. Wiley; Bruce E. Blough; John S. Partilla; Michael H. Baumann (December 2014). "Pharmacology of novel synthetic stimulants structurally related to the "bath salts" constituent 3,4-methylenedioxypyrovalerone (MDPV)". Neuropharmacology. 87: 206–213. doi:10.1016/j.neuropharm.2014.02.016. PMC 4152390. PMID 24594476. ^ Anna Rickli; Marius C. Hoener; Matthias E. Liechti (March 2015). "Monoamine transporter and receptor interaction profiles of novel psychoactive substances: Para-halogenated amphetamines and pyrovalerone cathinones". European Neuropsychopharmacology. 25 (3): 365–376. doi:10.1016/j.euroneuro.2014.12.012. PMID 25624004. ^ Meltzer, P. C.; Butler, D; Deschamps, J. R.; Madras, B. K. (2006). "1-(4-Methylphenyl)-2-pyrrolidin-1-yl-pentan-1-one (Pyrovalerone) analogues: A promising class of monoamine uptake inhibitors". Journal of Medicinal Chemistry. 49 (4): 1420–32. doi:10.1021/jm050797a. PMC 2602954. PMID 16480278. ^ Gannon, BM; Rice, KC; Collins, GT (October 2017). "Reinforcing effects of abused 'bath salts' constituents 3,4-methylenedioxypyrovalerone and α-pyrrolidinopentiophenone and their enantiomers". Behavioural Pharmacology. 28 (7): 578–581. doi:10.1097/FBP.0000000000000315. PMC 5599337. PMID 28570297. ^ "Reactions table". Reagent Base. Archived from the original on 2015-12-08. Retrieved 3 December 2015. ^ Eiden, C.; Mathieu, O.; Catala, P. (2013). 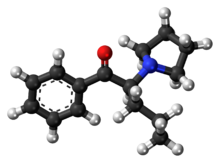 "Toxicity and death following recreational use of 2-pyrrolidino valerophenone". Clinical Toxicology. 51 (9): 899–903. doi:10.3109/15563650.2013.847187. PMID 24111554. ^ Baselt RC (2014). Disposition of toxic drugs and chemicals in man. Seal Beach, Ca. : Biomedical Publications. p. 1751. ISBN 978-0-9626523-9-4. ^ "Lists of:Scheduling Actions, Controlled Substances, Regulated Chemicals" (PDF). usdoj.gov. U . S . D e p a r t m e n t o f J u s t i c e. August 2016. Retrieved September 29, 2016. ^ "Decreto 29 dicembre 2011 (12A00013) (G.U. Serie Generale n. 3 del 4 gennaio 2012)" (PDF). Archived from the original (PDF) on 2016-07-01. Retrieved 2016-05-28. ^ a b Olding, Rachel. "'Bath salts' death: lethal drug was a top seller". The Sydney Morning Herald. ^ "Flakka, synthetic drug behind increasingly bizarre crimes". AP. 30 Apr 2015. ^ Joseph Steinberg (November 8, 2015). "Flakka: The New Illegal Drug You Need to Know About". Inc. Retrieved November 11, 2015. ^ Tonya Alvarez (April 2, 2015). "Flakka: Rampant designer drug dubbed '$5 insanity'". Sun-Sentinel. Fort Lauderdale, Fla.